The Zeiss Ikon Contaflex Super BC is a reflex of the late sixties with interchangeable lenses and a central shutter. Made from 1967 to 1970, the Zeiss Ikon Contaflex Super BC is the penultimate of the Contaflex series of cameras which extends from 1954 to 1971. The Super BC introduces battery-powered TTL light metering with a CdS cell and keeps the features introduced in 1959 on the first Super, i.e. the film advance lever in place of the knob and the interchangeable film back which made the reputation of these cameras. Otherwise, it keeps the main characteristics of all other Contaflexes. 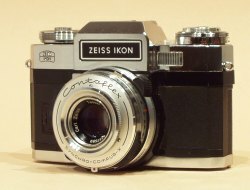 Aiming at the amateur market, Zeiss Ikon designed a SLR with a central shutter and a Tessar with interchangeable front elements. 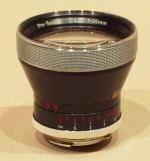 The front element of the built-in 50 mm f/2.8 Tessar can indeed be removed and replaced by complements with focal lengths of 35, 85 and 115 mm with a bayonet mount. The Super BC was made in chrome and black finish. The lightmeter used one now forbidden 1.35 v mercury battery but it can easily be adjusted for today's 1.5 v batteries with a little screw located at the back of the body. 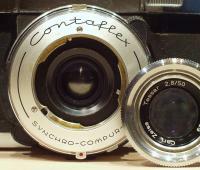 The Super BC was followed by the Contaflex S which was the same camera except for some cosmetical differences. The Contaflex Super BC is easy to use. The controls are error proof. 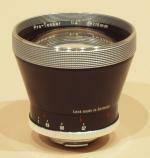 The viewfinder is clear and focusing is made with a classic stigmometer - microprism combination. Two exposure modes are available : manual or automatic with speed priority. The speed is shown in the viewfinder along with the diaphragm in automatic mode. The interchangeable front lens elements are easy to use thanks to an efficient bayonet (picture on the left). The central shutter is very quiet as, when shooting, the mirror flips up but doesn't flip down, reducing the noise by half. This makes the viewfinder go black after shooting, the image being shown only when the camera is cocked. The softness of the shutter release button is adjustable with a screw. The pictures produced by the interchangeable complements are sharp though one might not want to look too close at the corners. On very contrasted subjects the resulsts are sometimes weird. This camera, despite its uncommon technical choices, remains a good one if one doesn't need extreme focal lengths. The shutter at 1/500 s. The sound goes "click-click". The first click is the combined sound of the shutter and the mirror flipping up. The second click is heard when the shutter release button gets back into place.